-Results in negligible post-procedure discomfort. -Causes less abdominal cramping than insufflation using room air. -Is efficient in colorectal cancer patients with or without luminal narrowing. -Operates at a lower infusion pressure than manual insufflation. All MedicCO2LON products are supplied with a standard 3 year warranty, lowering the cost of ownership. With over 25 years experience of supplying medical electronics you can be assured that any problem your MedicCO2LON unit encounters over its lifetime will be fixed quickly and reliably. 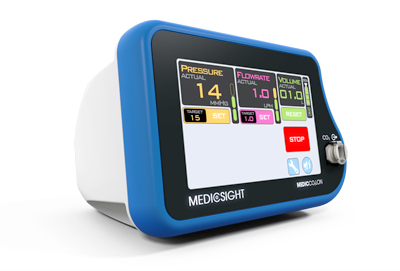 The MedicCO2LON provides automated colonic distension with CO2 gas for CT colonography procedures. The MedicCO2LON produces reliable colon distention while improving patient comfort. 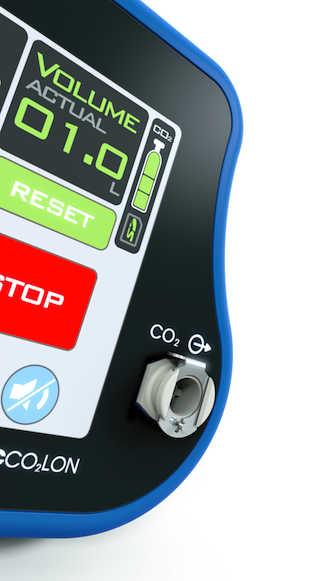 The MedicCO2LON features intuitive touchscreen controls for ease of use and reliable performance. 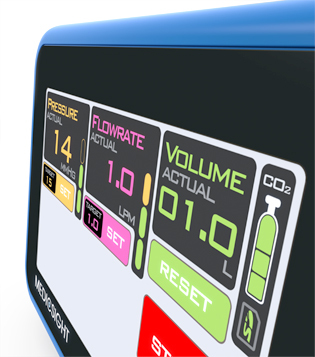 With an LED backlit display, measurements of pressure, flowrate and volume are always visible to the operator. The value of CT Colonography (Virtual Colonoscopy) is that it offers an accurate, rapid and minimally invasive means of imaging the large bowel, with the best results being achieved when a patient's colon is optimally distended. If the colon is sub-optimally distended then potentially crucial detail in the colon may be missed or distorted and the procedure may not be as successful for identifying lesions through the entire colon.